NEEDED: Substitute teachers. 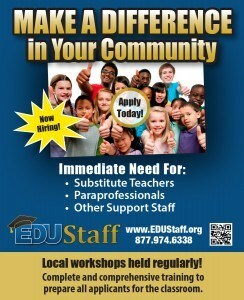 Apply to www.edustaff.org. Substitute custodians, bus drivers and bus aides–Contact Pete Dobrowolski at 231.627.4422 for more information.